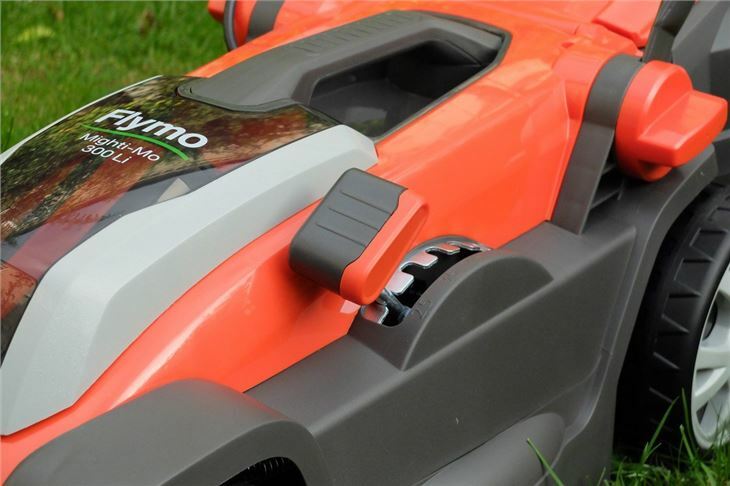 The Mighti Mo 300 Li is Flymo's only cordless mower competing with the Bosch Rotak range and similar cordless models from Ryobi and Makita. 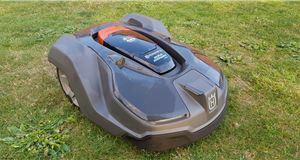 It's powered by a 40-volt lithium-ion battery which takes about two hours to fully charge and means the Mighti Mo 300 can cut a lawn of up to 250m2, equivalent to a full-size tennis court, on one charge - according to Flymo at least. It has a 30cm cutting width and a metal blade plus five adjustable cutting heights with ranging from 25mm to 65mm along. Catching all that grass is a plastic 30-litre grass box. 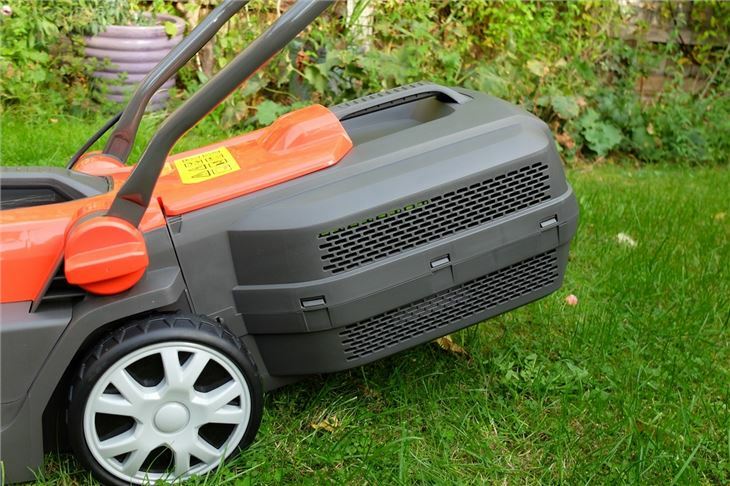 The mower itself has fold-down handles, making it easier to store, while it weighs just under 10kg. There's a removable key which means that even if you do leave the battery in, you can switch the unit off to keep it safe - useful if you have children around. It retails at £235 officially but we've seen it down to £160 at several online shops. You can also buy it as a bundle with a cordless strimmer but searching online, it actually works out cheaper to buy the two separately. The Mighti Mo is fairly easy to assemble out of the box. It took us about 10 minutes to build with the handle being the trickiest part to do - it's easier if you have someone to help you. 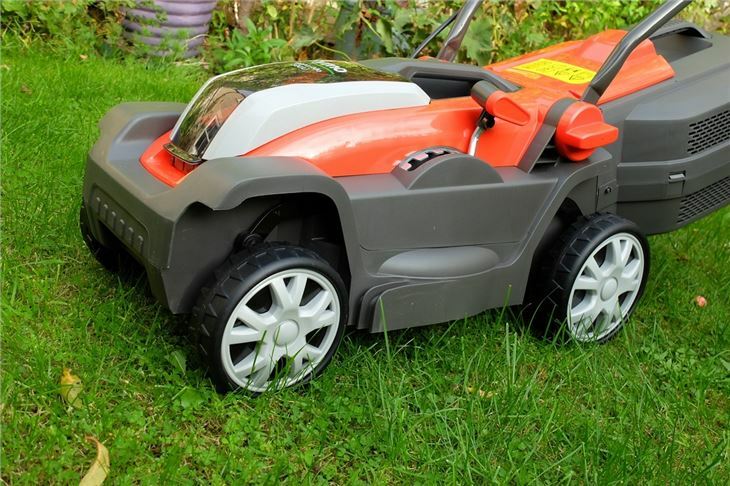 The mower itself is pretty light at just 10kg but doesn't feel the most robust of constructions, the grass box particularly seems a bit cheap and flimsy on first impressions. 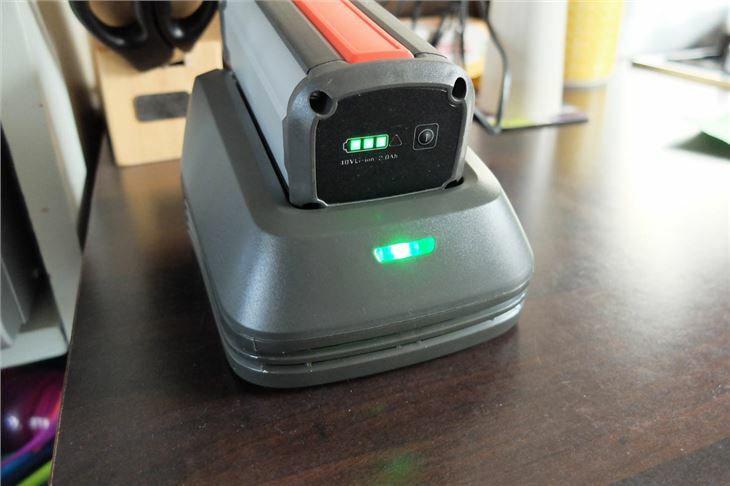 The 40-volt lithium-ion battery comes partly charged out the box and there's a handy light-up indicator on the side to show you how much power is left. It takes about two hours to fully charge the battery on the rather bulky charging unit that plugs into any three-pin socket. 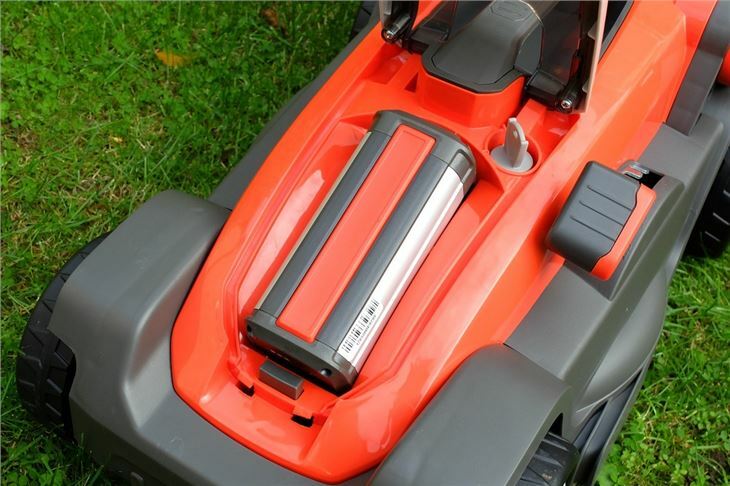 The battery slots onto the top of the mower under a smoked plastic cover but it can be a little difficult to get it to 'lock in' properly. A firm push down though and it clicks in place. 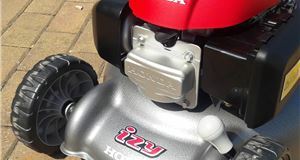 There's also a 'key' of sorts, which means you can switch the power off so the mower can't be accidentally started even with the battery in. It's a useful safety feature if you have children around. There are five different cutting heights, starting at 25mm and going up to 65mm. It's easy to adjust these using the lever in the side, it essentially just moves the body up away from the ground level - the picture below shows it at the maximum height. 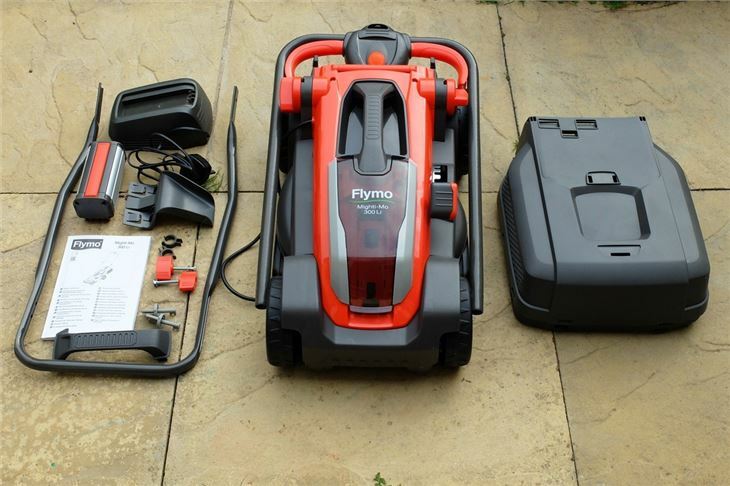 We tested the Flymo in the smallish garden, around 20m2, typical of the size you get on many new developments and far smaller than the 250m2 that Flymo says the Mighti Mo can cover on one charge. While the Flymo was pretty easy to set up and get going, we did have a few teething problems when we first tested it. 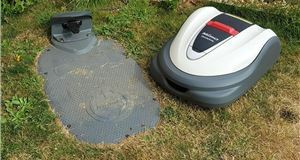 The battery had a habit of jumping out of its housing, especially when you knocked the mower against something like a garden pot or went over some uneven ground. We also found that it would stop working randomly, even when the battery was fully charged. It did this several times, which didn't get the test off to a promising start. However, after that, those problems have not repeated themselves and the Mighti Mo has been very reliable. We also found that fitting the battery in with a very firm push means it doesn't jump out. While the Mighti Mo can deal with longer grass, it's no heavy duty machine. 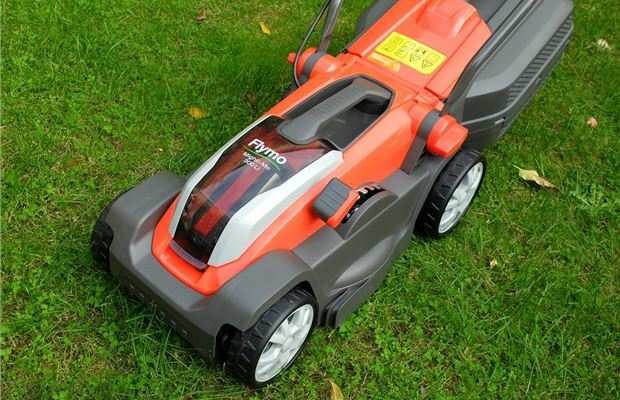 Instead, it's far better suited to use as a regular mower and we found it ideal on the lowest two settings, providing a neat and tidy cut. The grass box is a little on the small side at 30 litres and as we mentioned earlier, it feels quite flimsy. The opening is a little narrow too so it can take a lot of shaking to get the grass out if you don't want to get your hands dirty. But that said, it holds more grass than we expected and has stood up to being knocked around a fair bit. Thanks to its compact dimensions and light weight, the Mighti Mo is easy to navigate around small gardens. You can easily manoeuvre it one-handed if you've got to get to a particularly tricky bit. 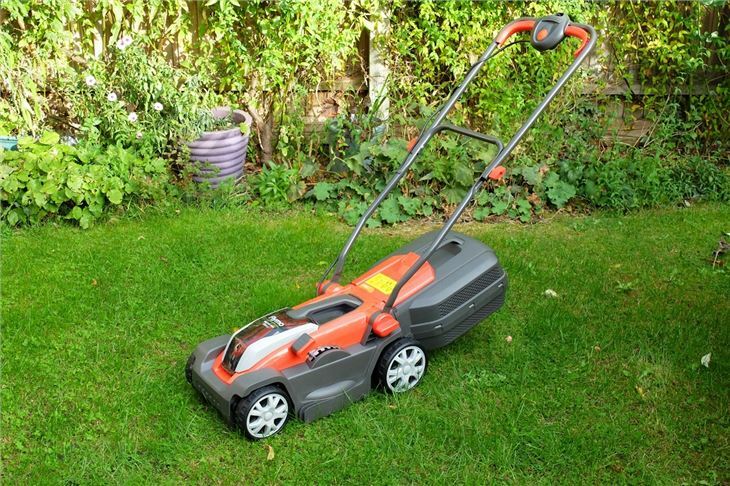 It runs smoothly and the handle feels solid and secure too - one of our complaints with cheaper mowers. It's also quieter than many corded mowers. 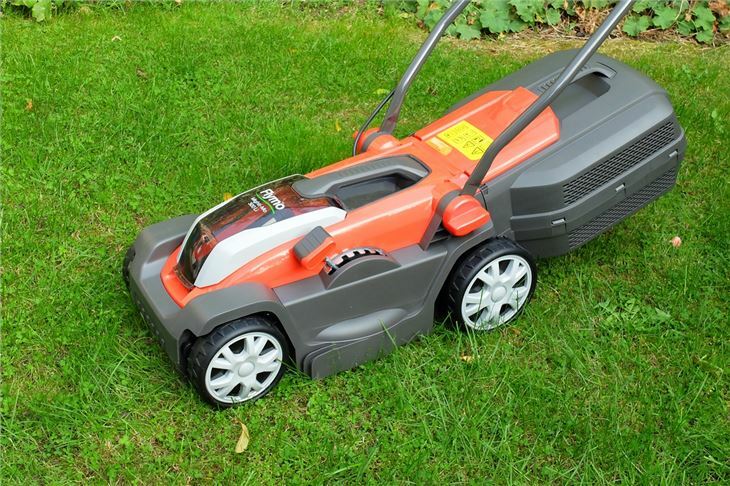 In terms of battery performance, we're managing about two cuts of our lawn on a single charge. That's some way short of the 250m2 that Flymo claims, but we imagine that most people will be putting the battery on charge after every use. We did have some concerns about range anxiety and had our old corded mower on standby just in case, but have not had cause to use it. Over the winter we didn't use the mower for several months and left the battery half full. Even then it managed another complete cut of longer wet grass with no issues. You'll read very mixed reviews online of the Mighti Mo 300, but our experience of using it over six months has been positive. We did have a few issues with the battery pack jumping out of the mower the first time we used it and occasionally it would also stop after a few seconds use. However, since then it has worked faultlessly and proved a great little mower for our small garden, despite the small grass box. It's easy to manoeuvre and gives a neat finish. Not having the hassle and inconvenience of a power cable makes mowing much quicker and it's ideal if you have awkward spaces to mow. It's also ideal if you want to mow an area with no power - we regularly use it at our allotment which has a few grass pathways that need to be kept in check. Its light weight also makes it easy to manoeuvre. 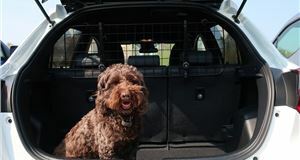 The Mighti Mo does come with a two-year warranty but bear in mind that the typical estimated life of a lithium-ion battery is only about two to three years and a replacement battery for this model will set you back £140. This is perhaps our biggest reservation with cordless mowers. While prices are coming down - the Mighti Mo costs £160 (about twice that of a standard corded Flymo) - it's hard to say exactly how long the battery will last before you need a replacement. 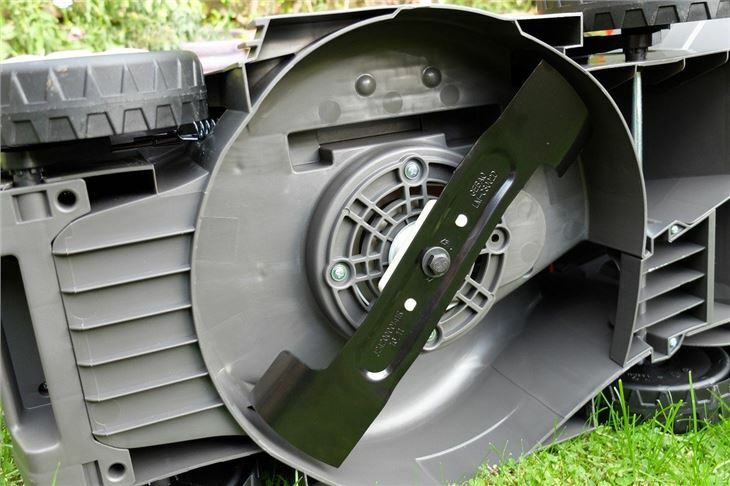 While we think the concept of cordless mowers is great, it's hard to recommend one knowing that you'll likely be forking out for an expensive replacement battery every few years.